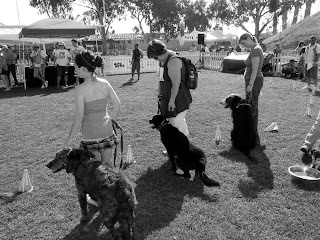 This past weekend, I had the pleasure of attending the annual Nutts for Mutts in Woodland Hills. This is a dog show that celebrates THE MUTT. New Leash on Life, an animal rescue organization, is in charge of organizing the event and you can check out their website at http://www.newleash.org/. For the first time ever, our clinic had a booth. I arrived at 7:30 in the morning to unpack and because I had stayed up until midnight watching Tomb Raider the night before, I was barely awake. I drove over a curb and nearly ran over a small dog. I'm just not a morning person and I was going to use this defence in court if I had to. By 8 a.m. it was already getting hot. Uncomfortably hot. I was wearing long pants and my scrub top that said "Dr. Phil" on it. This choice of clothing was unfortunate for two reasons. One: I knew that they were going to have record high temperatures and long pants turned out to be like a fabric oven. Two: When people saw that I was "Dr. Phil", they invariably joked about the comparison to the Dr. Phil on tv and I'm just not in the joking mood when my sweat glands are in overdrive. By 10 a.m., I was so freakin' hot that I was really quite apathetic about the show. I picked up my camera and I didn't even have enthusiasm for my photos. I clicked blindly not caring what I caught in my frame. 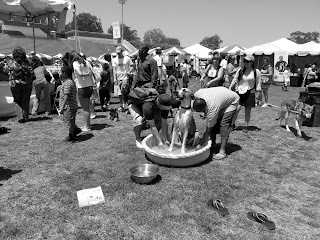 I felt sorry for the dogs but they had lots of water everywhere and I didn't see any dogs keeling over from heat stroke. Even the Bulldogs seemed to be doing okay. Maybe I'm exaggerating but it seemed like a summer in hell to me. My office manager, Annie, was showing her dog, Katie Scarlett. 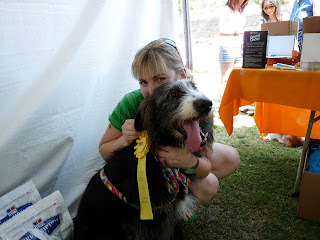 Katie is a wolfhound mix and was rescued after the previous owners no longer wanted her. Annie adores this dog. No, actually adore doesn't quite capture it. There really isn't a word for it. Let me put it this way; if Katie and Annie were on board while the Titanic was sinking, Annie would let Katie float on the piece of wood while she swam in the frigid waters, eventually disappearing into the icy depths. 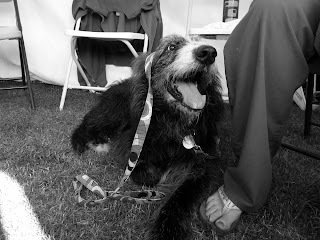 Katie went on to win 3rd place for most beautiful mutt. This was a proud moment for Annie and her very hot dog. 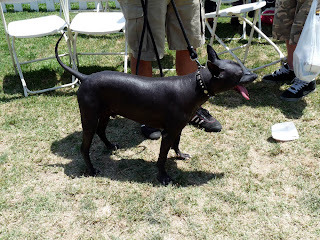 I snapped a picture of a Peruvian hairless dog. I've never seen one before and I had to ask the owner what type of breed he was. He was kinda cool looking. Shiny and black, like a canine 8 ball. Our booth was a huge hit. Not only was it the most colorful but it was also the most interactive. 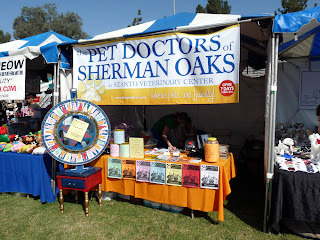 We had a wheel which you could spin and win amazing prices such as dog treats, Frisbees, goodie bags, free exams, free baths and free vaccines. For a dollar, you were also entered into a raffle for three baskets worth in excess of $180 each. That, my friends, is a bargoooon. The kids loved it. Some of them came back several times to hand over a dollar and spin the wheel. I wondered if some of them even had dogs. We also had a big jar full of biscuits. For a buck, you were allowed to guess how many biscuits there were and if you had the closest guess, then you won the jar. The answer was 627 in case you were dying to know. Strangely enough, I answered only one veterinary related question. Some guy wanted to know what he could do to keep his dogs out of his garden. Building a fence had apparently never occurred to him. This picture is pretty boring but it is way better than the others I snapped. By 4 pm, it was time to call it a day. I was soooo happy to jump into my car and turn on the air conditioner. Overall, I had a good time and all the money we raised (I'm not sure of the final tally) will go towards our rescue organization of choice, MUCH LOVE. http://www.muchlove.org/.